If you're looking for a fancy but simple chorus plugin, or you already have the original TAL Chorus plugin and are dying for an update, you're in luck. 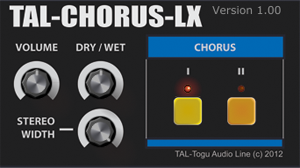 Togu Audio Line, the fantastic-- and mostly free-- plugin makers have released a 64 bit updated version of the chorus function included in their only premium synth, the TAL-U-NO-LX, a Juno 106 style plugin. This chorus is modeled after the Juno series' chorus, and it's called the TAL-CHORUS-LX. You can download it for free here, both PC and Mac compatible. This plugin sounds great, and can be applied to a wide variety of sounds. Perhaps my favorite is a Wurlitzer keyboard through this plugin, as it adds a nice big moving warmth to the sound. It's been used by some big name artists as well-- I know Fred Falke is a fan. If you like it, why not donate using their PayPal, or purchase their full Juno 106 recreation?